This kit is designed into ten different Christmas snowman cute cartoon characters. There is a full color LED behind, with 14 full color LED gradient modes, each LED effect is matched with a different Christmas song, with a total of 14 Christmas songs built in, so that the effect of the combination of sound and color can increase the Christmas day atmosphere! A PCB board consisting of 10 different Christmas snowman images. The middle letters of each Christmas snowman are combined into a "CHRISTMAS!" character. Adopt 5mm diameter RGB full color high brightness LED light, providing 14 kinds of backlight full color effect. 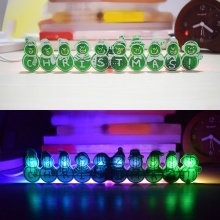 14 different Christmas songs, can be turned ON / OFF by the right switch. Toggle the middle switch to switch to the next lighting mode and the next song. Using DIP components design for beginner easy welding. Comes with a micro USB cable, powered by DC 5V. 1. Soldering temperature must be below 320°C, soldering iron temperature should not be too high, or else they may damage the LED. 2. When soldering LED, iron is the best grounding and it is best to wear anti-static bracelet soldering, soldering speed as quickly as possible.